We are excited to see what kind of creativity Viddory will stimulate as users young and old decorate and share short messages with friends, family and colleagues in their lives. 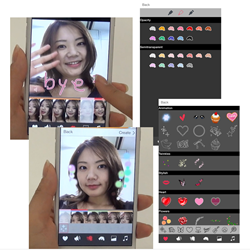 Today MetaMoJi Corporation releases a new iPhone video decorating and editing app for social media sharing. The new app, Viddory, was designed to give users a fun and simple way to personalize their own story by decorating short videos to send out via popular social media. Short videos that are 6, 10 or 15 seconds can be either filmed within the app or imported for embellishment. Pen tools allow freehand drawing as well as cool effects like animations, stickers, music and filters. The app represents another in a series of Mobile Productivity Solutions MetaMoJi has produced in order to help mobile users get the most productivity out of their phones and tablets. Viddory can be used on the iPhone to film, trim, annotate, embellish and share video stories with the simple swipe of a finger. Special effects can be quickly added to mini-videos through frame by frame handwriting and drawings, music clips, animations, stickers and filters. Results can be quickly sent out on Twitter, Facebook or other SNS or saved to the camera roll for upload to Youtube, Instagram and Vine. Viddory provides many of the professional effects of video editing without all the usual associated complication. Stickers, sound effects and music can be added to microvideos to add deeper meaning to the message. Viddory was built around the idea of instant gratification in telling a short video story. With only a few seconds to capture and convey a message, Viddory helps users to squeeze the most out of every frame of their composition. Viddory can be used for video blogging, sharing family moments, announcing events, sharing shopping tips, or just showing off talent. Teachers may enjoy using the app for engaging students to tell their story visually for a homework assignment. Those in the professional field could also find it useful in illustrating and sharing quick visual ideas among colleagues or in a team. The app is free for download from the App Store. For an upgrade of $1.99, users can also disable any in-app advertisement. Eraser (in multiple sizes) to get it just right! MetaMoJi creates products to break barriers between devices and users with revolutionary applications on smartphones and tablet devices. MetaMoJi’s unique innovations give users the comfort of an analog experience with the convenience of digital technology. MetaMoJi’s mission is to contribute to the advancement of human beings with unique applications to collect knowledge, write documents, organize ideas and share them with others. Please visit the corporate site at http://www.metamoji.com for more information.